FREE EBOOK – and the next 2 books in the series are FREE with this book! In this Series, Bible Truth comes alive through imagery and allegory – in fantastic, exciting adventures. In the first story, the children will face danger and excitement in the perilous land of Err. When Timmy is taken captive by the dreaded Snares and carried far away into the dark forests of Err, Jack and his friends set out to rescue him. But do they really know how to defeat these foes? Have they armed themselves adequately for the fight? 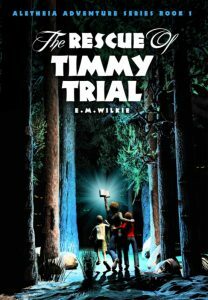 Or will they fail to rescue Timmy Trial? The book is approximately 42,000 words long, and includes 27 illustrations. Also available in paperback!